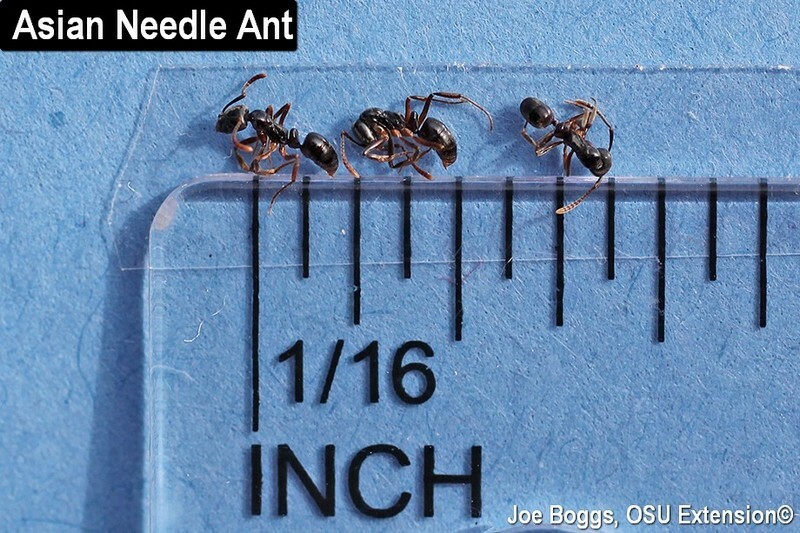 Ant specimens collected in mid-November in southwest Ohio were confirmed by the United States Department of Agriculture, Animal and Plant Health Inspection Service (USDA, APHIS) to be Asian Needle Ants (Brachyponera chinensis (syn. Pachycondyla chinensis)). This is not the first report of this ant being found in the U.S. However, it is the first confirmation of this non-native stinging ant being found in Ohio. Asian needle ants are not a regulated pest targeted for eradication. That's because this ant has been in the U.S. since the 1930s and is now widespread in a number of states. Thus far, active populations have been documented in Alabama, Florida, Georgia, North Carolina, South Carolina, Tennessee, Virginia, Connecticut, and New York. As with Emerald Ash Borer (Agrilus Planipennis), Asian needle ants are now so pervasive over such a wide geographical area that it would be impossible to eradicate this non-native from the U.S. However, localized Asian needle ant populations found in new locations, such as southwest Ohio, can and should be targeted for elimination. This ant is a serious concern for three reasons: it stings; it can invade homes and other structures; and it can wreak havoc on forest ecosystems. The ant specimens in Ohio were collected from a single site and aggressive actions were taken to destroy the population. At this point, we do not know whether or not this was a "one-off" occurrence with a single population becoming established in Ohio that has now ascended to ant heaven, or if this is the tip of the needle ... ants. That's because cool temperatures that arrived shortly after the late-season discovery suppressed ant activity which limited the success of surveys for new populations. Of course, this means we must be vigilant as temperatures warm in the spring which is why I'm going to include this ant in my presentation "Alien Insect Invaders: New Arrivals and Usual Suspects," in next week's Tri-State Green Industry Conference. Unfortunately, I had to rely on alcohol preserved specimens for the images in this report. However, you can clearly see that these ants have slender shiny black to dark brown bodies that measure around 1/8" in length. One striking feature is their long, spider-like light-brown to orangish brown legs. Also note that these ants have a single, bulbous node (petiole) between their thorax and abdomen. Whether or not ants have one or two nodes (one lump or two?) is an important ant identification feature. For example, Fire Ants (Solenopsis spp.) have two nodes. The general shape of the top of the thorax is also an important identification feature. The top of the Asian needle ant's thorax is uneven as opposed to the evenly rounded thorax seen with a number of other common ants including Carpenter ants (Camponotus spp.). Asian needle ants nest in wide-ranging locations. While they prefer forested locations and are typically found beneath moist leaf litter, rocks, or in rotted logs; these ants will also nest in landscape mulch, compost bins, and in homes as well as other structures. They are "meat eaters" meaning they will forage wherever they find tasty meat-treats such as dead (or live) insects and other arthropods as well as earthworms. They have a particular affinity for termites. Needle ants may also find their way into kitchens and dumpsters. Their colonies may consist of several nests grouped together (polydomous) and each nest often has several queens (polygynous). However, these queens will split from their nests throughout the season to establish new nests; a quality that supports the rapid spread of needle ants. The "needle" in the ant's common name refers to this ant's sting. We have ants in Ohio that can deliver a serious bite, but none that can sting like their bee and wasp cousins. A survey of sting victims published in 2006 in the Journal of Medical Entomology (see More Information below) showed individuals can experience a range of reactions to needle ant stings. The majority (80%) of the victims experienced localized redness and swelling that expanded to about 2" around the sting site with hives sometimes developing at the site. The pain from the sting lasted 2 hrs. to 5 days. More troubling, 8% reported significant local reactions including swelling, recurring pain, and severe hives with symptoms lasting 3 – 14 days. The authors concluded that "P. chinensis [B. chinensis] represents an emerging public health threat throughout its present range in the southeastern United States." Thankfully, reports indicate that unlike fire ants, these ants are not very aggressive towards humans. They will often flee from probing fingers rather than sting. However, their wide-ranging nesting habits can place them in close proximity to people where they can present a serious threat. Asian needle ants are highly competitive with several characteristics that give them six-legs up on other ant species. As with most ants, cold fall, winter, and spring temperatures suppress their activity; however, needle ants are able to become active in early spring prior to other ants "waking-up" from their winter naps. This means they can get a head-start on foraging and staking out new territories. Their production of multiple queens which split from their nests means they can rapidly spread to new locations. Their aggressive foraging means they can out-compete other ants for resources and their bellicose behavior includes attacks on other ants which means they can directly eliminate the competition. Indeed, a study conducted over several years by researchers in North Carolina showed these ants can even displace highly aggressive Argentine ants (Linepithema humile) which have been documented to out-compete fire ants (see More Information below). The bottom line is that Asian needle ants are capable of taking over the sites where they become established including forests. I strongly urge the you remain vigilant for Asian needle ants in Ohio this coming spring and throughout the growing season. I would appreciate receiving any reports of people being stung by ants; just click on my name at top of this report to get my e-mail address. While needle ants can't be eradicated from the U.S., it would be a good idea for us to slow or prevent (if possible) the spread of these ants into our state by eradicating any newly discovered populations. Asian needle ants can be effectively controlled using a wide-range of insecticides; many were developed for fire ant suppression. These includes baits where insecticides are brought back to nests by foragers as well as residual contact insecticides that can be directly applied to eliminate nests. Of course, as with any pesticide, you need to read and follow label directions including making certain the site you are treating is on the label. For further reading, I've included a number of resources below under "More Information."